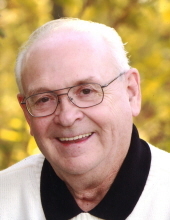 Michael F. McCarville, 79, of Cedar Falls, died Monday, January 21, at home. He was born April 21, 1939 in Lime Springs, son of Michael and Frances Turek McCarville. He married Judy Ann McDonald on October 7, 1961 in Newhall. She died January 25, 2013. Michael was a veteran of the U. S. Army. He was employed with Chamberlain Manufacturing Company and later with Covenant Medical Center. Survivors include: three sons, Joseph (Cris) McCarville of Fort Dodge, Chris (Melissa) McCarville of Springdale, Arkansas and Dan McCarville of Louisville, Tennessee; a daughter, Molly McCarville of Cedar Falls; eight grandchildren, Tina, Josh, Joey, Nathan, Evan, Tyler, William and Walker; a sister, Madonna Reisner of Calmar; a brother, John (Judy) McCarville of Springfield, Missouri; two sisters-in-law, Inez McCarville of Dike and Arlene (Paul) Jaehrling of Waterloo; many nieces and nephews; and a special friend, Peg Bardsley of Waterloo. Preceded in death by: his wife; three brothers, Edwin, Ray and Dave McCarville; a sister, Aurilla (Ray) Craft; and two sisters-in-law, Joan (Neal) Sloan and Darlene McDonald. Services will be 10:30 a.m. Saturday at Immaculate Conception Catholic Church with burial in St. Mary’s Cemetery, both in Gilbertville. Full military rites will be conducted by American Legion Post 714 and the Iowa Army Honor Guard. Visitation will be from 4 to 7 p.m. Friday at Hagarty-Waychoff-Grarup Funeral Service on South Street, where there will be a 4 p.m. rosary. Visitation will continue at the church for an hour before services on Saturday. To send flowers or a remembrance gift to the family of Michael F. McCarville, please visit our Tribute Store. "Email Address" would like to share the life celebration of Michael F. McCarville. Click on the "link" to go to share a favorite memory or leave a condolence message for the family.